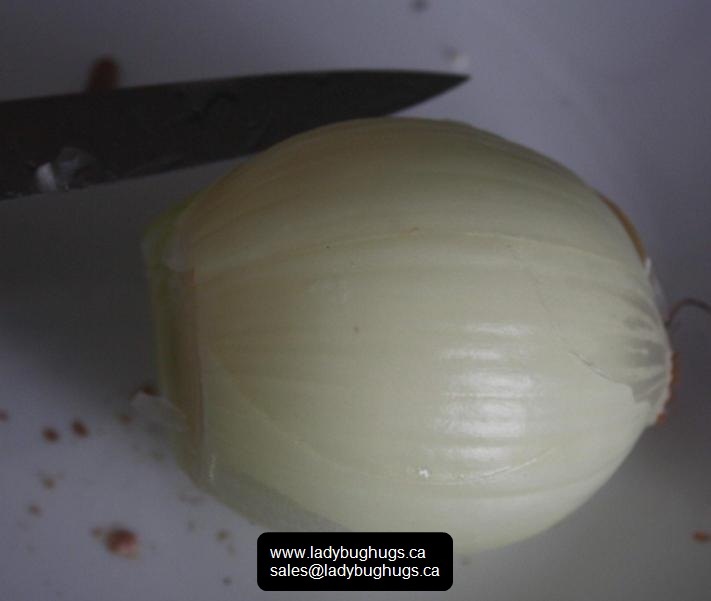 Chopping an onion, without tears..
Take a peeling knife and make about 6-8 thin very shallow slits all the way from root to top. This will make it a snap to remove the dry skin part, and the first thin outer layer. 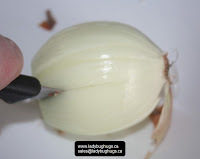 Take your knife, and cut onion in half, from root to top (not in two) - see pics. depending how fine of a mince/chop you need, make 1 or 2 more slices, from root to top, on either side of first slice. 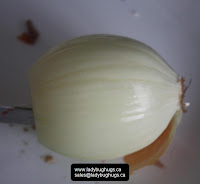 turn onion so that the slices you just made are parallel to the counter/cutting board. repeat the slices above. 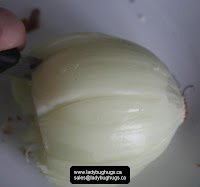 holding onion by root end firmly, chop "slices" starting at the top, and your onion will fall off your blade, already chopped! A LAST trick. 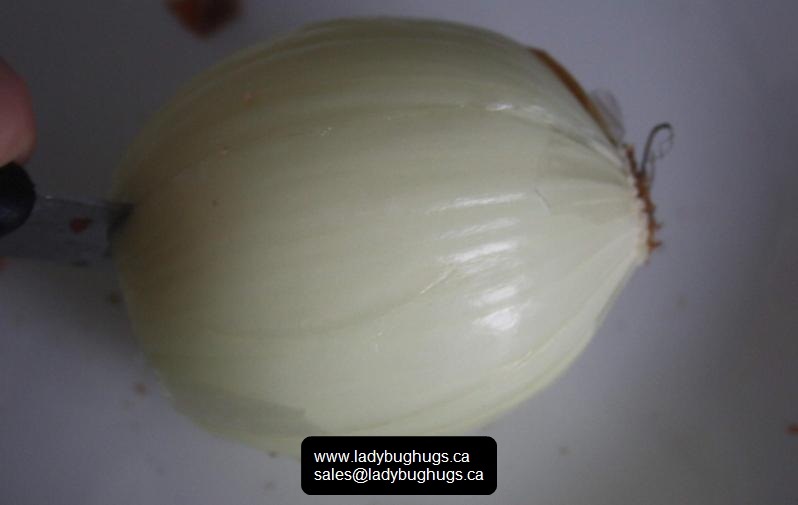 To avoid crying over spilled onions (or was it milk?) 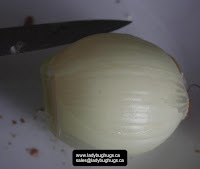 here's a quick trick I've found helps a little bit... rinse your blade (knife), your cutting board, AND the onion (after you've chopped its top off) in cold water. 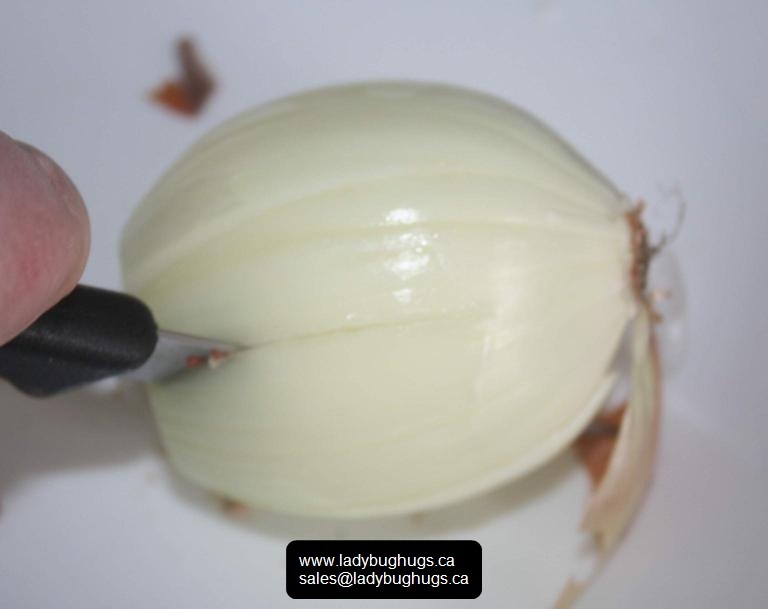 When you are done chopping, rinse ALL utensils/board/plates immediately in cold water. Trust me on this one. notice how my knife is finishing the first slice. I'm going for grossly chopped onions. 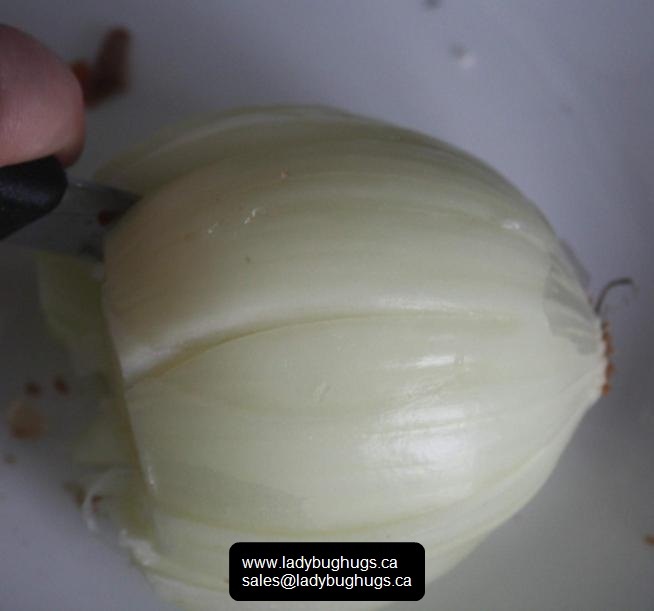 you can actually get pretty finely chopped onions doing it this way. I've turned the onion, and am starting on the other side. The onion will have a tendency at this point to kind of separate. so you may want to carefully hold the root end and a little bit of the body with your fingers. I've left this picture larger, so you can see the actual slices. At this point, you'd start slicing from left to right (top to root) (I'm a lefty) and the picture below would be your result. If like me you get migraines that are lovingly triggered by foods, know you are not alone. I've kept track over the years, and analyzed what I ate, especially when I got slammed with a migraine. 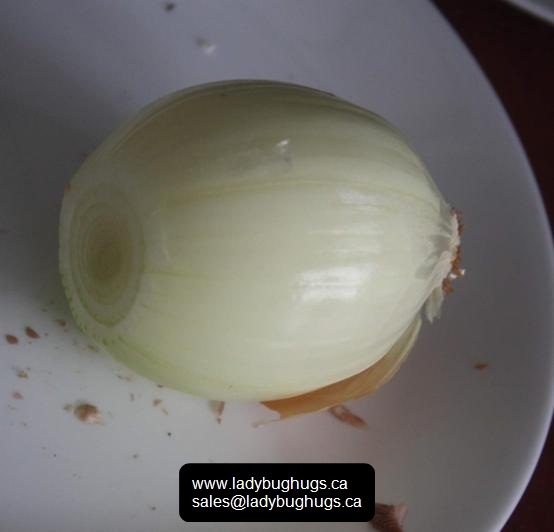 To my surprise, about 15 years ago, I realized that onions were one of the culprits. Actually, the sulphur, the juice stuff, which is more concentrated in the super thin layers on the inside of the peel is the culprit. bad BAD onion! BAD! BADBADBAD! Why the spazz-out you ask? 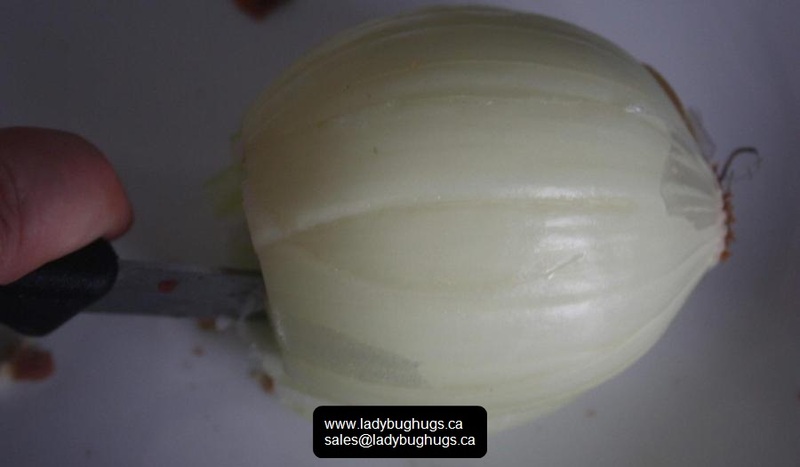 I like onion sandwhiches, with either red or green onions, with salt. Weird I know. Back to our little discovery... 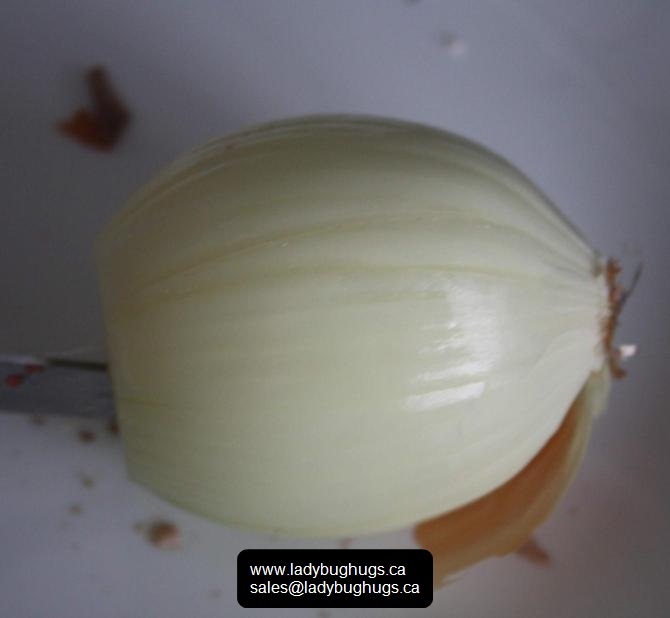 I was heartbroken, when I realized, most of my foodstuffs would have to be made without onions, which I love! So, I read up on things, and researched the net, and when I read the part about the sulphur... it dawned on me. 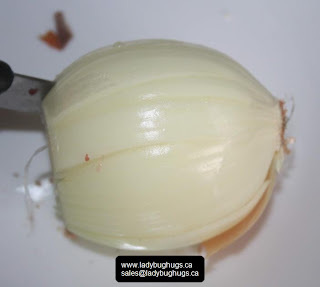 The most concentrated part is the center of the onion. Short of removing the super-thin skin on each layer (which would promptly get anyone committed), how about.... so I tried it. I removed the center rings, and used the outer rings to cook. 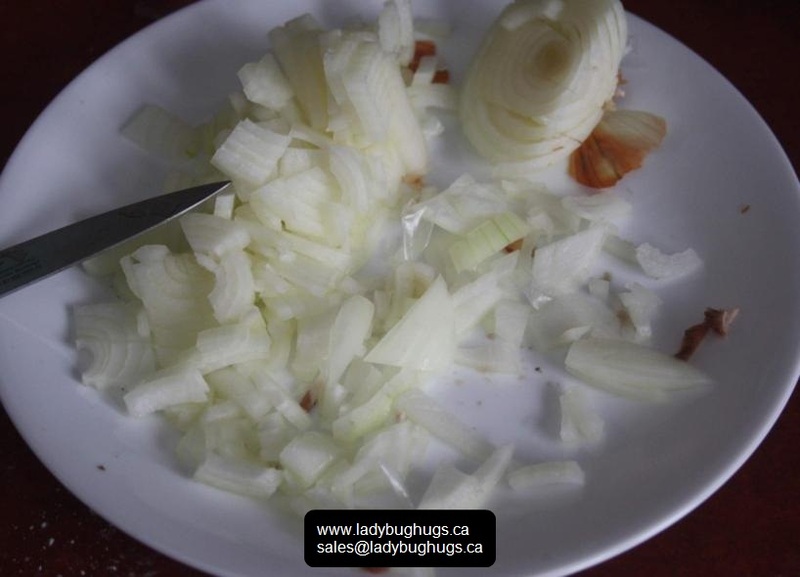 and the migraines diminished GREATLY, when I ate onions. It won't work ALL the time, but, most of the time is better than nothing no? I also noticed that if I eat massively processed chocolate (like bars, candy etc.,) I can easily get nailed by a migraine. Problem is, I LOVE chocolate (I love food. nuff said). My favorite is black chocolate. So, again I researched, and lo and behold, there is less added stuff in the black chocolate. So, I decided to try eating ONLY black/dark chocolate, and never mind anything that's below 60% black. (I actually like the 85%... weird I know). and you know what? the only time I get a chocolate triggered migraine, is when I eat the bars/processed ones... Food for thought. Some foods will give me migraines, BUT, if I behave and not have nasty food for say, a year or whatever, I can pretty much safely have it ONCE and enjoy it oh so thoroughly... without getting slammed. Its different for everyone I'm sure... and maybe there are foods that make you or someone you know react that are fine with me. We're human :) Cheese for the most part does not always bother me (only if I REALLY overdo it and I'm right on the edge here!) I rarely eat the old stuff however, and when I do, its in TINY portions, and I savor it. Lastly, Pepsi, if consumed in huge amounts, gets me a free migraine! (I used to drink that stuff like tap water!) so now, I occasionaly treat myself to ONE can, and that's it. BUT, I can drink gingerale, no problem. Its weird, and interesting I find, what triggers and does not trigger migraines. Some people are sensitive to wine (and pork). I don't drink so I would not be able to tell you. As for pork, the ONLY time I eat it, is in wonton soup. I really don't care for it, especially since it does not agree with me. But that is for another day.